Recently I have been working with a customer, as well as with my colleagues at Fieldglass, to help improve the ability to do Work Item Approvals using SCP Mobile Cards. One main reason that the customer is doing this is that not only are they able to approve/reject multiple different types of Work Items from Fieldglass, but Mobile Cards is allowing them to also do approvals in other environments that are both SAP and third-party systems. This gives them a single application that links to multiple back-ends and can perform many different tasks, as you hopefully seen in other blog posts that I’ve made. If you aren’t familiar with Fieldglass take a look at the website and specifically, for this discussion we are looking at the Vendor Management System. What I want to show is how we went about creating a Time Sheet Approval card. The card itself isn’t the important part, but it’s how SCP Mobile Services and Mobile Cards has quite a bit of flexibility to deal with different back-end systems, as well as I’ll introduce you to some java script in the card itself in order to help display the data. Fieldglass itself has multiple scenarios to work with and almost all the approval scenarios can be setup similarly to the Time Sheet scenario. 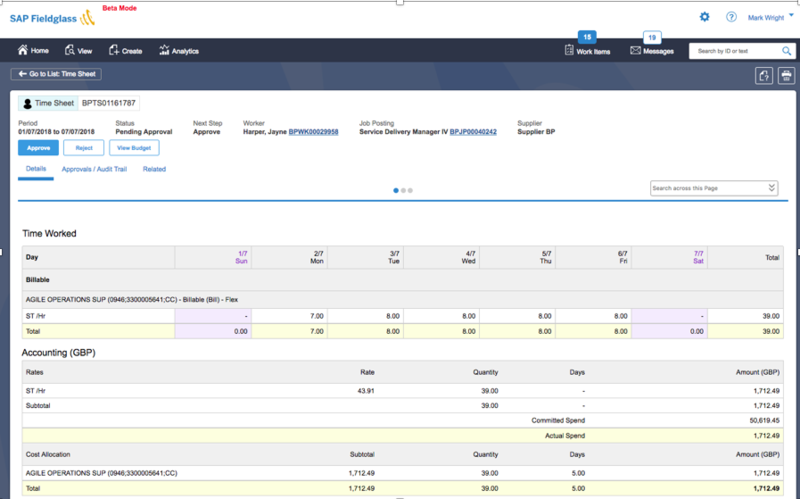 You can try out Fieldglass Approvals using SAP API Business Hub, as well as you can check out the API Doc. Note; The card is using some optional fields in the Timesheet module that are enabled on a per customer basis, it may be required that you either enable those fields in your landscape or change the card to fit what is being returned. For the example the ST/Hr is an optional field called Per day: Quantity: ST . . That field is not enabled by default. I’ll make assumptions that if you are reading this you have read the docs, done the tutorials, or read other posts about Mobile Cards and only give the information on how to get cards working for Fieldglass. I will outline to scenario’s starting with being able to get approvals from a Fieldglass environment that your company already has access to, and then also, being able to get approvals from the SAP API Business Hub. The API Hub only shows Job Postings, so the card will be different but gives you an environment to test with. Fieldglass uses OAuth 2.0 for Authentication. This requires you to obtain an access token before making a call to the Rest API to get the Approvals. In order to do this with Mobile Services you will need to create a destination that uses OAuth2 SAML Bearer Assertion for its SSO Authentication. 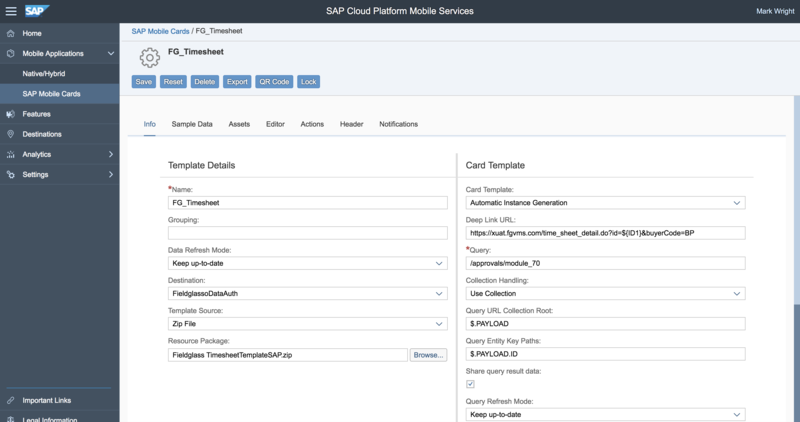 For this Authentication to work you Fieldglass needs the signing certificate from your SAP Cloud Platform so it can be applied to your Fieldglass Cloud Server. 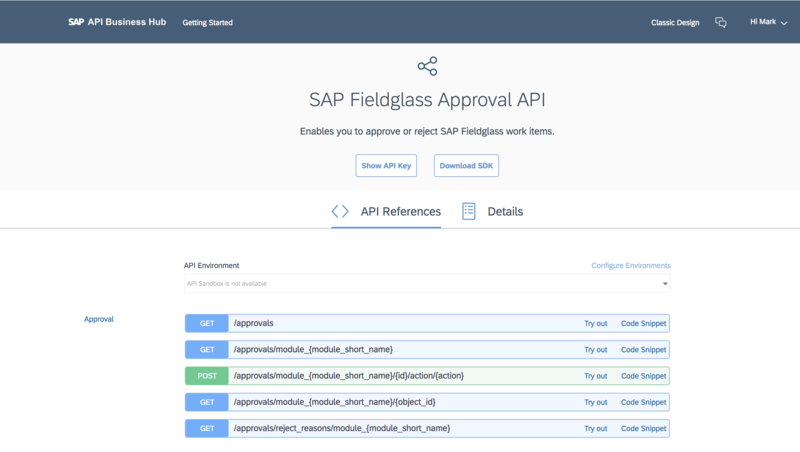 This will allow Fieldglass to authenticate your SAP Cloud Platform account in order to obtain the access token allowing you to then pull the approval lists and perform actions on those Approvals. Open a support ticket with Fieldglass and let them know what you are configuring. 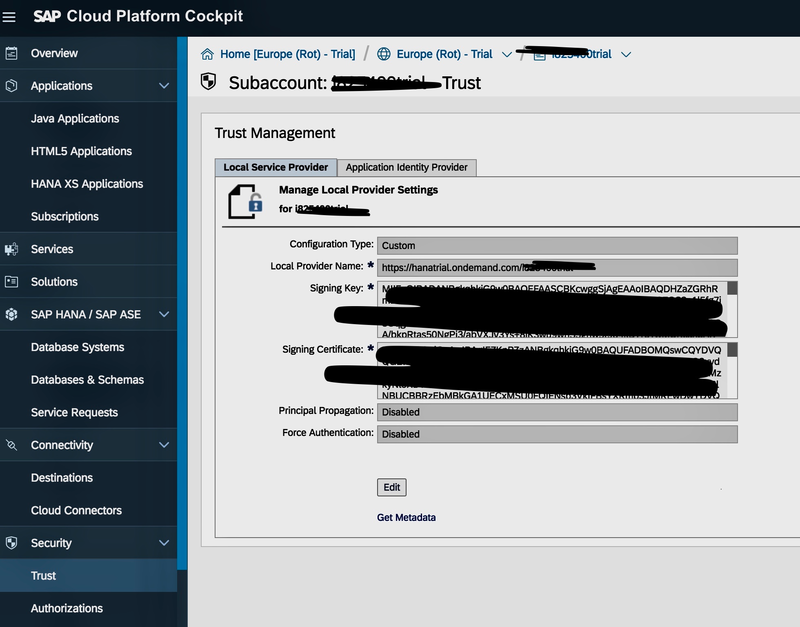 You will need to send them either the Metadata file or the Signing Certificate that can be found by going to the Security->Trust section of your SAP Cloud Platform Cockpit. In the Local Service Provider change the Configuration Type to Custom. You can copy the Signing Certificate Key and send it to them, or Save and then use the Get Metadata link to save the file and send that to them. 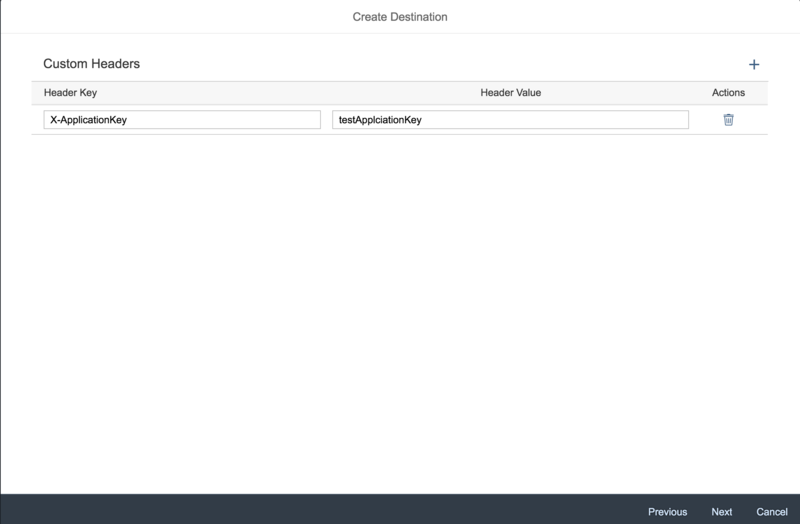 If you are doing this in a trial environment or in a factory tenant landscape that has not been configured with your own IDP, you can save the settings in the Local Service Provider tab and then when you go to Application Identity Provider you will see that the Trusted IDP is now pointing to your account URL. Selecting that URL, you will see that the information is already configured, you can cancel out of this screen. It is important that if you are using SAP IDP for authentication, once you have sent your information to the support team, change the Configuration Type in the Local Service Provider back to Default so you do not affect other services in your environment. Once you hit save, you will see that Default provider is set back to accounts.sap.com. Now that you have your information to Fieldglass we need to create the Mobile Destination. you will see when creating the SSO you will need some information from Fieldglass that is specific to your environment. Please request those from Fieldglass support, I will highlight those in bold below. In the Mobile Services Cockpit create a new Destination and select the Type to be Mobile Destination. The Destination Name can be whatever you like, for example Fieldglass. You should now have a destination that allows you to authenticate and get approvals from your SAP Fieldglass environment. From here you can play try out some of the API’s, so you are familiar with what is returned for various different approvals. In the Mobile Services Cockpit create a new Mobile Destination and name it whatever you like, fieldglass_playground for an example. Now that we have the Destinations setup it’s time to import the card. In Mobile Services make sure you go to Mobile Cards and then Connectivity and add the destination that you created. Create a new card, and from the Resource Package use the Browse button to find the zip file that you downloaded. Change the Name to what you want it to be and set the Destination to your created destination from above. Once you save the card, open your Mobile Cards app on your device and subscribe to the card.